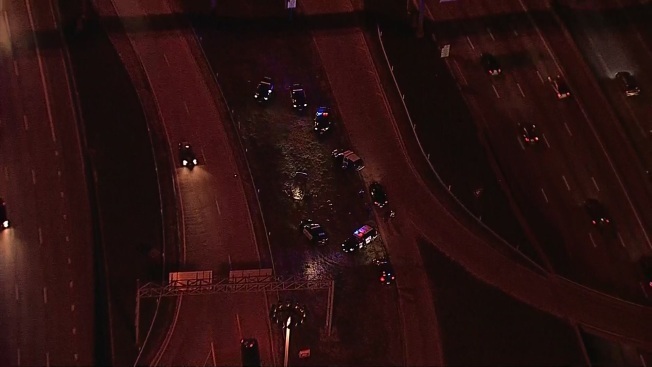 A high-speed police chase out of Grand Prairie ended with a car upside down on an Interstate 30 median in Dallas early Wednesday morning, police say. The chase started in Grand Prairie at Main Street and Loop 12 about 4:20 a.m. when police attempted to stop the driver, who they discovered had outstanding felony warrants, police said. The driver drove away and a chase ensued -- at times hitting speeds up to 100 mph. While approaching the Cesar Chavez ramp near downtown, the driver lost control of the vehicle and flipped it, police said. Two people from the vehicle were arrested. One was hospitalized with injuries.